Well yesterday was very wet and floods hit last night as we had indeed tweeted warnings of earlier in the week. 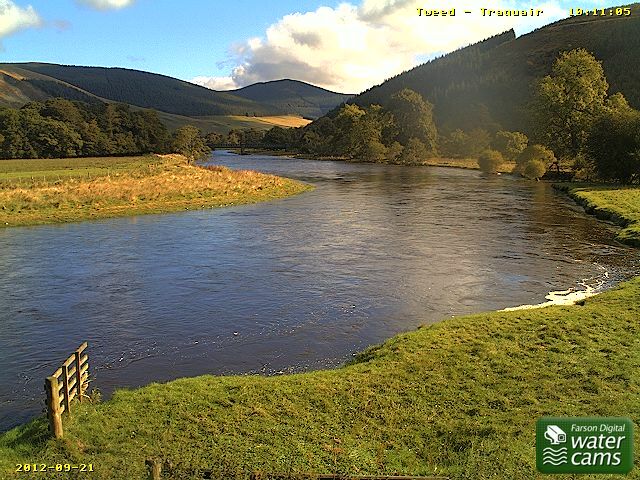 However the sun is shining at Traquair this morning as you can see and there is no rain forecast for the next couple of days and the light Northerlies are going to swing round via the East to become Southerly light breezes. BUT before you get too excited, “child of tropical storm Nadine” is set to throw winds with gusts of up to 45mph and rain at us on Sunday night and Monday with most of it coming from the East to North East direction. The forecast we can only hope is wrong, as it is advising up to 40mm of rain on Monday and Tuesday/Wednesday is forecast to be only a little better with moderate gusts from the East and lighter rain before the barometer starts to rise again slowly towards the end of next week. Doesn’t look good and it’s a real shame for the last weeks of the trout season. Let’s hope this lot swings away from us and we escape, as the forecasters are having real problems with this depression, I think we know how they feel!